Why BioComplete Natural Diets and Herbs? First and foremost, let us point out that every day we are seeing more and more pet food vendors promoting raw food, all natural and holistic diets. This is wonderful progress in the pet food industry, however we must remember the importance of being sure you are selecting not only the correct products but also making sure that the company selling it to you truly cares about your pet’s well-being and is experienced and knowledgeable enough in BOTH pet health and nutrition. We here at BioVance Animal Health, Dr. Diane Sudduth, DVM and Bill Piechocki, Nutritionist have utilized our cumulative experience and expertise in order to produce our unique formulas for BioCompleteTM Natural Diets and BioCompleteTM Natural Herb blends. These products are formulated all pets idealistically starting them young in order to promote, clean, chemical free, healthy and long lives. We also provide our special needs diets to many pets with existing ailments that have come to us for help. On any given day we address pets with cancer, irritable bowel, liver and kidney, allergies, diabetes, skin and coat along with hip and joint and many other issues. Cat on insulin and “special food” for diabetes that was off insulin in three days. Dogs with liver “failure” with only weeks to live still with us five years later. Persian cat diagnosed with PKD and only expected to live another year still healthy ten years later. We recently got a question from a pet owner concerning their pet producing stools that were either too hard or too loose. This owner thought that they were on the right course with an all-natural, raw diet from another source. While this obviously is better than dry kibble foods, it did include bone meal and other highly processed ingredients in the mix. Let us give some very simple explanations based on going back to nature and our extensive research in the lifestyles of our pet’s predecessors. In nature, when animals eat species appropriate diets, stool is usually soft, formed and minimal. This is because these foods can be processed more efficiently and end up completely digested and metabolized. Color and texture of stool will vary depending upon the actual foods, season, and body condition. BioCompleteTM Natural Diets follow a more strict prey model than many other foods. In nature, carnivores eat poultry, small animals and fish which are consumed completely, meaning that all the bones are also eaten. However, in a larger prey model you will find mostly red meat & pork, more muscle and organ meat being consumed. All BioCompleteTM Natural Diets of poultry, fish and rabbit are ground with bone-in which means that it’s in proper proportion with the muscle meat. Too much bone will cause drier harder stool as the body tries to eliminate the excess. This is just creating waste and also makes defecating more difficult for your pet. In addition to our diet entrees, we suggest all-natural BioCompleteTM Raw Meaty Bones from time to time. These can be substituted for meals or as a treat item. We also provide bulk and whole core meats for creating your own meals. 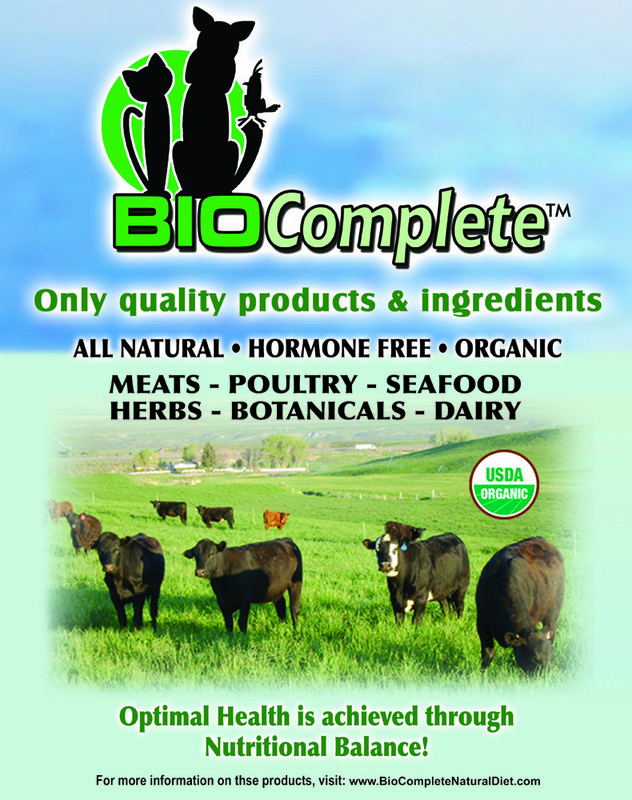 BioComplete Natural Herbs are an integral part of the natural foods we supply. In nature, carnivores and many other animals are capable of balancing their own nutritional needs by ingesting micro amounts of various botanicals and herbs, often in the form of herbal teas. Yes, you read that right, botanical teas. You see, in nature, animals seek out specific puddles, ponds and streams based on what their body needs. It is actually a form of self medication. At BioComplete we offer as individual dry powders and leaves and also specific blends for individual challenges. BioComplete Naturals round out the line with healthy choices like Diatomaceous Earth Powder (used both internally and externally for its many uses), drinkable Aloe, raw dairy, and much more. All our foods and products are organic where possible, naturally raised, chemical free, local when possible and sustainable. Herbs and botanicals are packed in recyclable glass in order to prevent contamination. BioCompleteTM DOES NOT add bone meal, synthetic vitamins, preservatives, stabilizers to any of our products as the manufacturing process in producing these does contain harmful chemicals like most commercial products. All our ingredients are selected specifically for their nutritional and health benefits. ← Do I Choose Vitamins, Supplements or Herbs?